Viettel Military Industry and Telecoms Group (Viettel) is the only representative of Vietnam to exhibit 8 Vietnamese technological products at the GSMA Mobile World Congress 2018 (MWC 2018) currently happening in Barcelona of Spain. The products and services which were researched and developed by the Group itself for various fields include education, mobile finance, network security, tourism, customer-protection solutions. These have already been successfully applied in Vietnam and are now on the way to seek international investment. Among the above products is the Data Monitoring System, which can help Viettel thoroughly understand each customer’s experience of its own services in order to produce a solution to optimize its network as well as to design suitable services in accordance with each customer’s habits and preferences. This system outweighs other similar products in the international market thanks to its state-of-the-art technology since Viettel not only employs DPI - Deep Packet Inspection, Big Data but also applies the knowledge of a world-class telecom carrier. The similar monitoring system has been offered for sale by a foreign partner to Viettel at the price of $25.5 million, 8 times as high as the cost that Group spent on developing the system nationwide (which is around $3 million). In this event, Viettel is also introducing its Telecom Anomaly Detection (TAD) Solution to specifically protect the backbone network in order to protect mobile subscribers from the risks of location tracking, wiretapping, mobile phone number faking, and account money stealing. At the moment, in the world, only a few carriers are able to use this TAD technology, so Viettel’s TAD has a promising future globally thanks to its benefits of being practical, easy to update. It can also obtain a deep understanding of the network since it is applied into Viettel’s own network. Viettel’s real-time cost calculation system vOCS 3.0 is also a milestone product to be displayed at the Congress. This system of the Group has a capacity of managing 24 million numbers per site – the largest in the world at present since the previous largest was only able to manage 12 million numbers per site. The most significant feature of vOCS 3.0 is the ability to customize package to suit every client – a very important attribute in the era of 4.0. Right now, this system is being implemented in 6 countries to manage 140 million subscribers. According to Mr. Tao Duc Thang, Deputy General Director of Viettel, the Group is showcasing its products at MWC 2018 with the aim of displaying a new view on the Fourth Industrial Revolution, which is ‘According to Viettel, nothing is impossible to happen, nothing is impossible to create’. The Group asserts that in this Fourth Industrial Revolution, Vietnam is able to make new internationally competitive technological products thanks to their practicality. And after successfully implementing them in the nation, we are perfectly confident to introduce them globally. GSMA Mobile World Congress is the world’s largest exhibition for mobile industry. The 2018 GSMA Mobile World Congress took place from February 25 to February 28, 2018. It attracted 200 nations, 60% of which are from Europe, 18% from America, and 15% from Asia. It had more than 2,200 booths and invited 3,800 international bodies of communications. 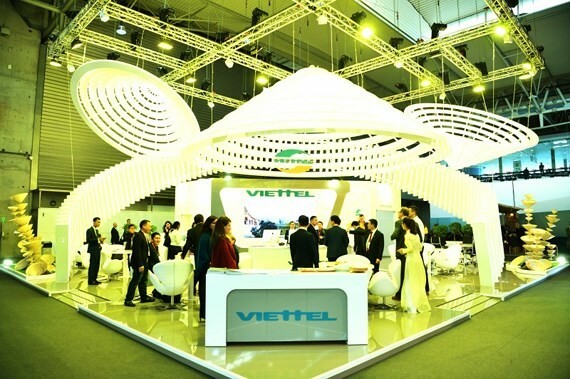 This was a very good opportunity for Viettel to meet and connect with other foreign businesses in the industry.